I know what you’re thinking…the Wii has too many party games, right? 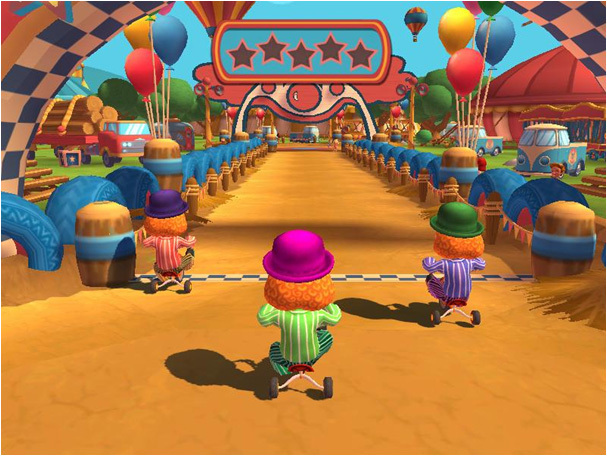 There’s no doubt about that, but when its creators are Cat Daddy Games (Carnival Games – one of the best party games compilation) and 2K Play (Axel & Pixel – XBLA) join in on the fun, there might actually be something worth checking out in “It’s My Circus”! 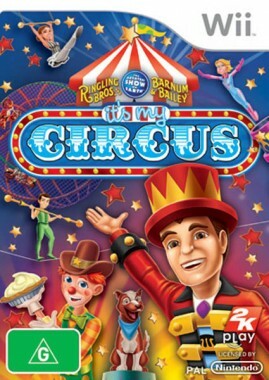 First of all, some of you may not know that The Ringling Bros, Barnum and Bailey Circus really exists and is MASSIVE in America, so that’s why the long title of the game features them. Now all that remains is to see if they’ve also made a good entrance in video games. Let me begin by saying that this is a game designed especially for kids…as soon as you start the game, a helpful (though annoying) voice starts explaining what each button of the menu does, even telling you that, when typing your name, the letters change to lower case automatically (really? o_O). 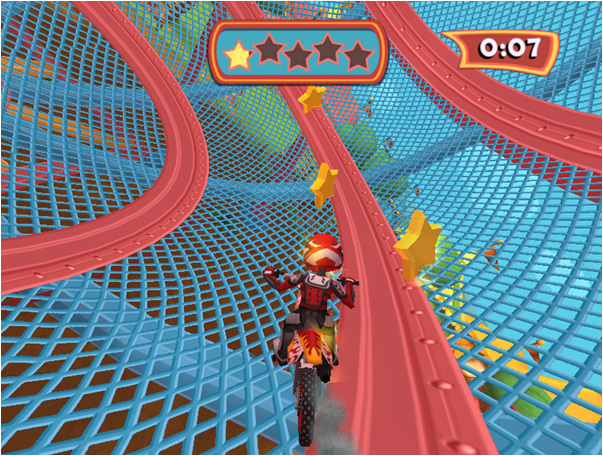 So from now on I’ll review this game from a kid’s point of view and for what it’s designed to – having fun. So on to the games! This compilation features over 40 mini games for you to choose from,varying from using the balance board to…keep your balance on a high wire, being a live cannon-ball, timing your moves as a trapezeist, taming the tigers, teaching your doggies to sing along on a tune and, of course…clowning: be that pie dodging, clown bowling or juggling. All of the games are grouped according to their type: Stunts, Animals, Trapeze, Acrobats, High-Wire and Clowns (ugh! 🙂 ). 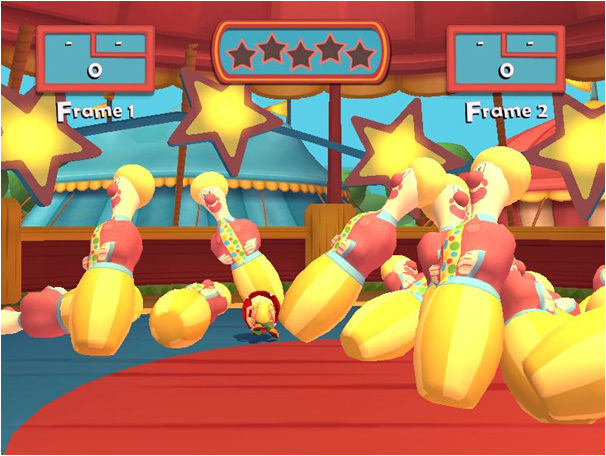 While playing the games, you earn Barnum Bucks, which are used to buy clothing and other fun unlockables for your character. Also by performing well in your everyday mini-game circus life, you earn stars, which unlock the higher tiers of the park: The Zing Zang Zoom Tent and in the end, Barnum’s FUNundrum (why would they name them that way?). There isn’t an actual story to the game (what did you expect from a party game? ), but the unlockables are enough to keep the players interested and entertained in front of the TV for quite a while. The controls can get a little frustrating at times, not that they’re difficult to learn, they just don’t work the way they should, and I could only imagine how a kid would react if their doggies weren’t barking in tune with the melody. But having the option to use the balance board instead is a definite plus and something different to other titles of the genre. In terms of graphics and audio there just isn’t that much to say. The cartoonish graphics fit really well with the theme of the circus, everything being colourful and happy. They could have put a little more effort in character design, though, but I guess it won’t hurt the eyes of a little kid if he sees a misshaped head from now and then. It’s way better than Wii Sports, in any terms. The audio is very jovial, with circus melodies and funny clown accents…though the soundtrack can get repetitive after a while. Taking all of these things into consideration, I’d say that this compilation is awesome for the little ones and even as a great party activity, that’s why I award “It’s My Circus” 8/10 Capsules!